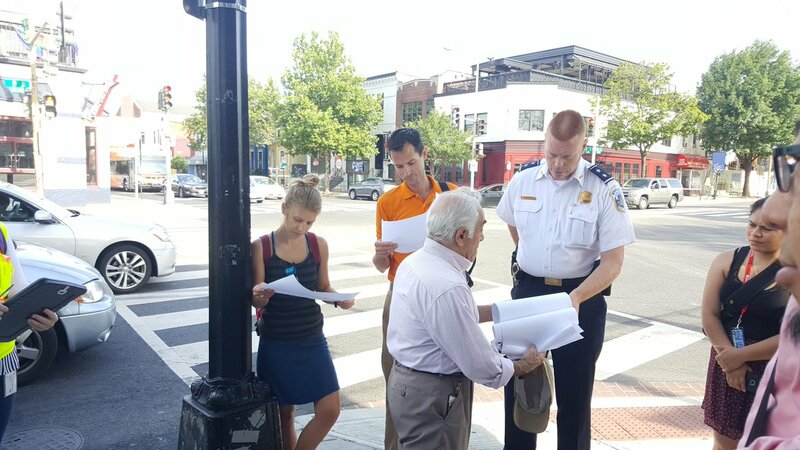 BAC members joined DDOT staff and other stakeholders to survey high-crash intersections in June. At six sites over four days, public officials and community leaders gathered to observe the infrastructure and multimodal traffic flow and make recommendations to improve safety. The intersections were Massachusetts and Observatory NW, Connecticut and R NW, Martin Luther King, Jr. and Good Hope SE, Southern and Wheeler SE, 9th and U NW, and 3rd and D NW. BAC Ward 1 member Emily Oaksford, leaning against lightpole, at 9th and U NW. Photo by @DCVisionZero. BAC member Jeff Johnson at 3rd and D NW. Johnson is pictured at center between the DDOT personnel in vests. Photo by @DCVisionZero. These were the most recent site visits to improve road safety and decrease fatalities and serious injuries, the basis of D.C.'s Vision Zero program. Previous field visits are summarized in these 2015 and 2016 reports. In other news, the BAC Planning Committee submitted official amendments to the D.C. Comprehensive Plan. Through the spring, the Office of Planning invited the public to propose changes to the core document guiding D.C.'s growth and development. In March, the full BAC received a briefing on the process. The newly formed Planning Committee then convened to study the existing document and propose changes to the bicycle-related provisions. This was the first BAC project overseen by Mt. Pleasant resident John Serrao, who volunteered to chair the new committee last year. Serrao led several committee meetings this spring at The Potter's House in Adams Morgan. BAC members attended the in-person meetings and collaborated through an online document to give input that Serrao ultimately edited into official BAC amendment proposals by the June 23 deadline. A D.C. bicyclist for more than a decade, Serrao got involved in the BAC on the recommendation of a friend in the transportation sector. An eye-opening experience with a novice bicyclist pushed him to step up and take action. "I really understood how unsafe it can be to bike when my sister-in-law moved here last year," said Serrao. "I took her on a ride and she asked me, 'How do you do this?' 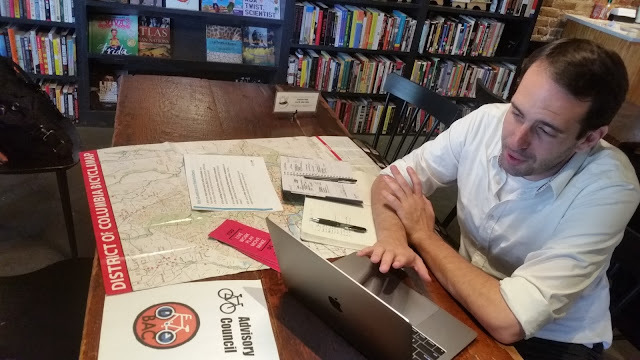 I knew I had to do something to improve bicycling in D.C."
Under Serrao's leadership, the committee will continue to work on other projects in the coming months. Meetings are open to the public, as is committee membership. 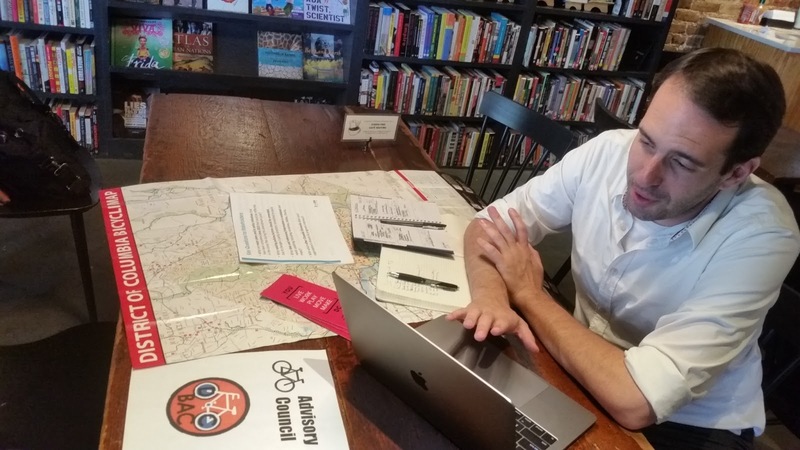 D.C. bicyclists are encouraged to attend committee and full BAC meetings. 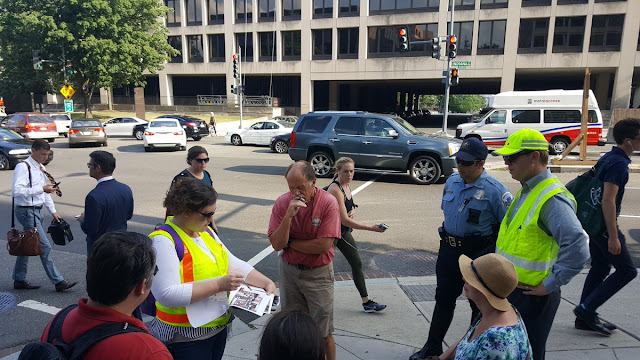 Also in June, the BAC's Facilities Committee went on a fact-finding ride through Capitol Hill and the Legislative Committee held its regular meeting. The BAC is pleased to welcome DDOT Director Leif Dormsjo to its July 12 meeting. The meeting takes place at 6 p.m. at 441 4th St NW, Room 1112. Meetings are open to the public. ID is required to enter the building. The BAC will suspend most routine business to focus on discussion with Director Dormsjo. The agenda is here. The BAC will also monitor and/or attend the Ward 5 transportation roundtable on July 13 and the July 20 meeting of the Downtown West Transportation Planning Study.